A six month excavation in the heart of London has revealed thousands of artifacts illuminating the city’s Roman past-including an extremely interesting sheet of decorated leather as yet unidentified. Working ahead of construction on the Bloomberg site, home to London’s Temple of Mithras( MOLA) Museum of London Archaeologists have recovered around l0,000 objects spanning the whole period of Roman occupation in Britain, from AD 40 to the early 5th century. Archaeologists discovered the 1.2m long leather panel beneath a pile of amphora shards, buried in a pit dug beneath the floor of a building thought to be from the 2nd century. Its stitched decorations show a warrior-possibly a gladiator or a heroic figure- with a mythical half- horse half- fish creature called a hippocampus on either side, and palmettes at each end. We are very excited about this object as it seems to be completely unique in the Roman Empire, ‘ MOLA Roman finds specialist Michael Marshall said. ‘ As it is unparalleled, we are not quite sure what the panel is from. There have been a few guesses such as wall hangings, window surrounds, one suggestion was even part of a vehicle like a litter or chariot. Conservation is being carried out at present and it wont be until afterwards when the leather object can be handled and the different layers disassembled that archaeologists will be able to tell how it was constructed,and what it was attached to. The panel survived because of the site’s location along the Walbrook river, where waterlogged conditions have created a perfect environment for the preservation of organic materials such as wood and leather, MOLA discovered the timber building platforms, fences, and drains, as well as over 100 fragments of writing tablets, some of which still show traces of lettering, and hundreds of well preserved shoes. This Amber Gladiator Amulet was also found in the Walbrook area. It was thought to have magical powers. The Roman author Pliny describes how amber amulets could protect children from illness and the symbolism of the gladiator may also be protective. 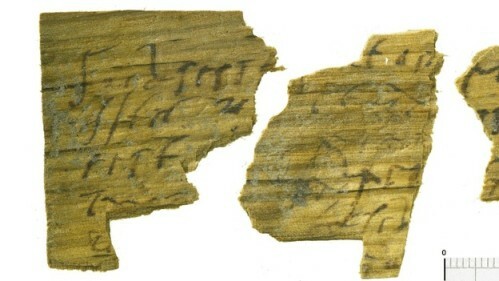 More than 100 fragments of wooden tablet have been preserved. This tablet is a letter to a friend.These wooden tablets were used for everyday correspondence and even shopping lists or party invitations. 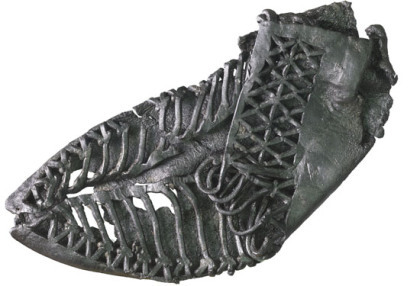 Many Roman well preserved leather shoes such as these were found. Original source Museum of London Archaeology. 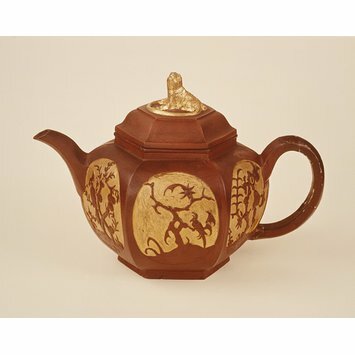 I think that those of you reading my posts must know that my main interest lies in Ancient pottery. 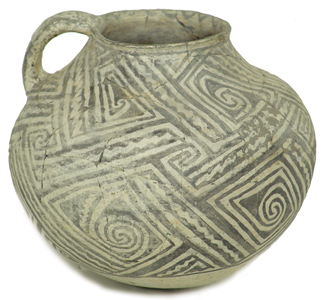 I have blogged about Pottery from the Neolithic, Bronze and Iron Ages, the Roman through to the Medieval and Post Medieval periods.This post is about pottery made and decorated by The North American Indians.Their pottery is well known for its artistic beauty. But first here is a brief history of their way of life. These are people who relied mostly on the flesh of various sorts of animals as the mainstay of their diet .From the animals they also obtained other necessities for their existence such as, skins for clothing and shelter. Sometimes the diet was supplemented by a certain amount of gathering of roots, berries and other commodities.The Blackfeet who hunted buffalo upon the plains for example, hunted moose upon the Canadian Shield. 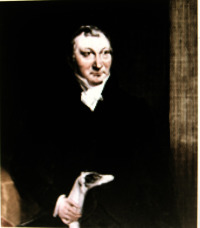 These people lived primarily in coastal regions where the stores of fish and other seafood could be had,thus satisfying dietary requirements for the people of this area. These people were Nomads who wandered about in search of edible flora and fauna in order to stay alive. 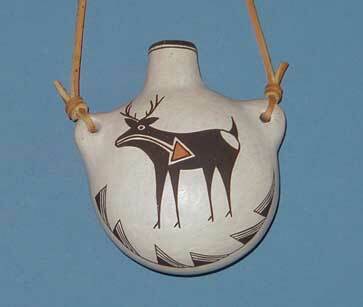 The Paiute tribe of the Great Basin area are classic examples of the people. Indian people were extremely successful farmers who provided for most of their needs by tilling the soil. 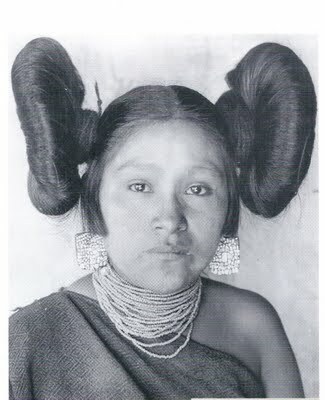 The Native Americans lived in particular environments adapting to his surroundings with a keen sensitivity. It is thought that the North American Indian was the first and most natural ecologist we have known. From his living by nature he was careful not to destroy the natural basis of life within an area. From the Indians arts and crafts we can see that he possessed an ability to adapt and use the natural resources from any given region.The major categories of artistic production point to the importance of natural materials and their availability. 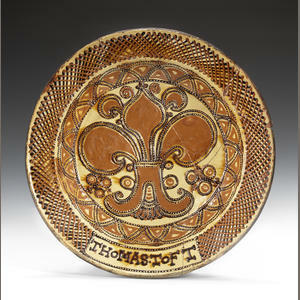 The Native American Indian made their pottery from natural clays in various regions. 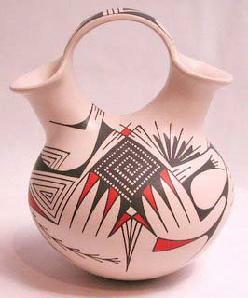 They learned how to make containers of durability and beauty. 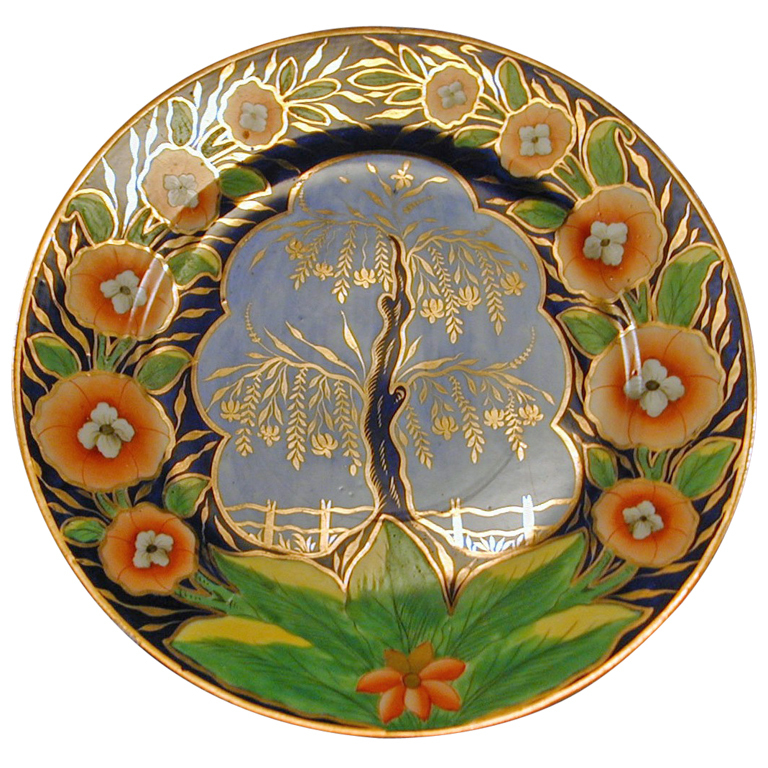 Normally pottery was made by people who lived in a relatively settled way of life since pottery does not survive well under nomadic conditions. 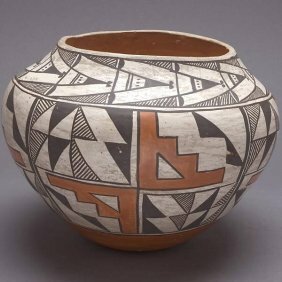 Pottery was produced primarily in the American Southwest, the Southeast and woodland area, some was even manufactured in earlier times by farming tribes on the Plains. It was decorated in a bewildering variety of ways. 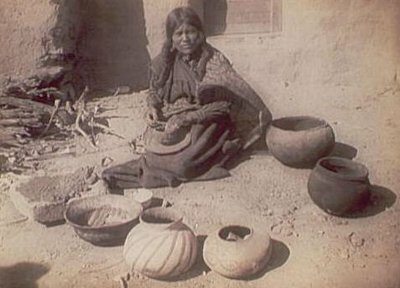 The North American Indians never had the potters wheel so all pottery was made by either the coiling or modeling and paddling method. 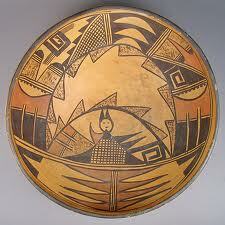 Variations in design were largely tribal and these designs can be quite complicated but beautiful. 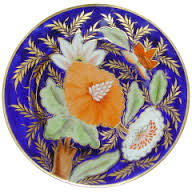 POTTERY USED FOR FOOD PREPARATION AND SERVING. 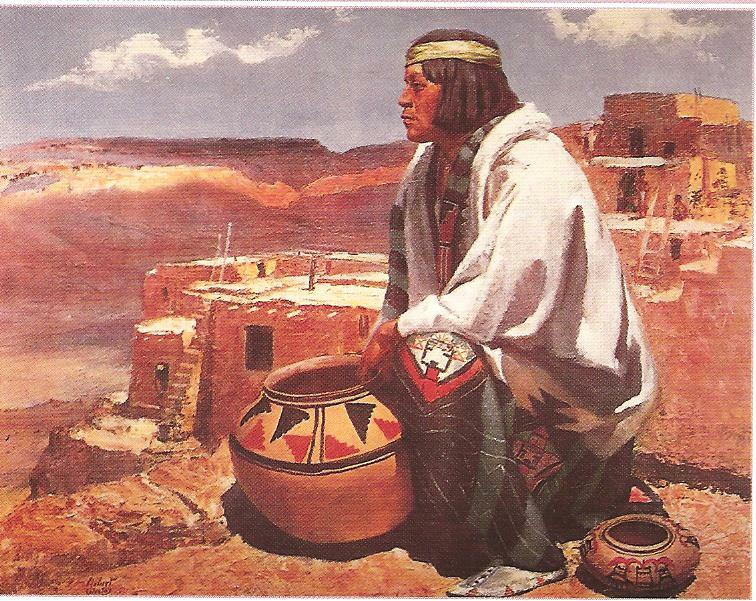 Food preparation and serving is an essential part of all Pueblo ceremonies, important ceremonies were usually attended with feasting. Special foods maybe associated with particular ceremonies that require planning and preparation to insure that the ingredients are at hand. The cooking may take place for several days even weeks. Depending on the scale of the ceremony, large groups may be recruited to prepare food, including the tasks of grinding and cooking to make sure that enough food is available. 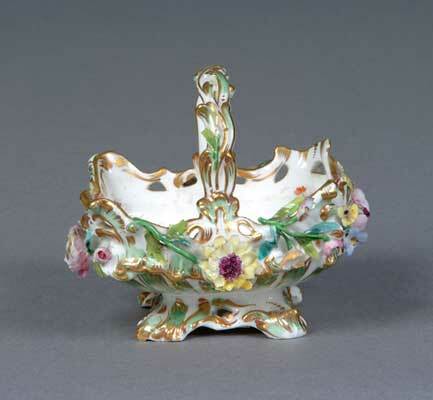 Ceramics would be used as containers for the preparation of feast foods, as a means of transporting foods to other places where they are consumed, and as service to participants and audience. COOKING IN EARLY VIRGINIA INDIAN SOCIETY. 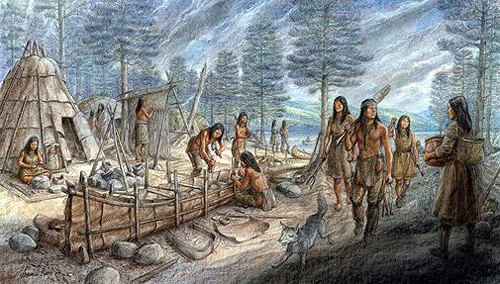 Early Virginia Indians hunted, fished and collected wild grains and berries, which they prepared in different ways. Meats were roasted, while grains and tubers were pounded into ashcakes and then baked. 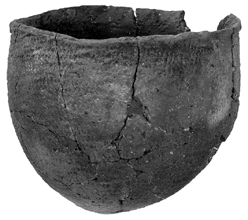 For many millennia, boiling water was difficult, but by the late Woodland Period (AD900-l600) technology had improved among the Powhatan Indians of Virginia so much so that a large ceramic stew pot became the focus of family eating. Roasted meats, shellfish, and wild berries were all added to the stew, which boiled throughout the day. Rather than prepare set meals, family members who spent the day gathering food or doing chores added to the stew as able and eat from it as necessary. Wild grain and, later, domesticated corn were harvested and baked into bread. The Powhatan’s generally avoided seasoning also salt, they most likely enjoyed food for its texture rather than its flavor. 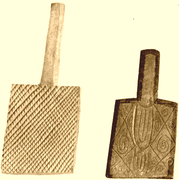 Although the Indians domesticated beans and squash, they ate more corn(maize) than any other crop, sucking unripe ears for their sweet juice, baking cornbread, or roasting it. What is known about Indian cooking in this period is based on research from Paleobotanists and Paliazoologists about what wild foods were available, as well as eye witness accounts from English colonists. 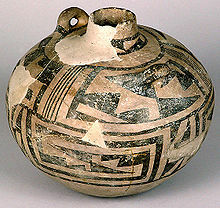 During the Early Woodland period (l200-500 BC ) pottery making was introduced from the south, and the boiling food- especially meat and dumplings made from wild grains-became common. 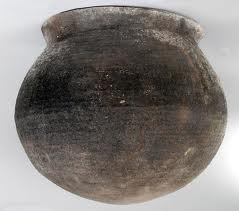 In fact, during the Late Woodland period, a large ceramic stewpot was kept on the boil for much of the day. The Virginia Indians mostly cooked on open-air fires usually located outdoors and in pots with conical- shaped bases propped upright with stones in order to control the heat, they added firewood to or subtracted it from between the stones. 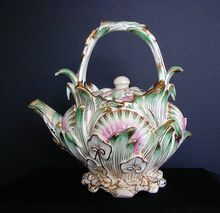 Because the heat source was all around the pots instead of just below them, liquids came to the boil about thirty percent faster than on modern stove tops. 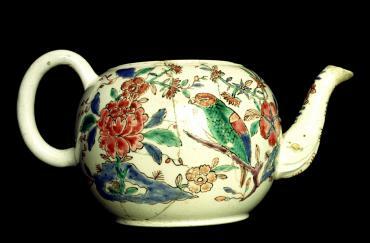 Indian cooks either roasted their meat and fish or cut it up- head entrails, and all- and added it to the stewpot. 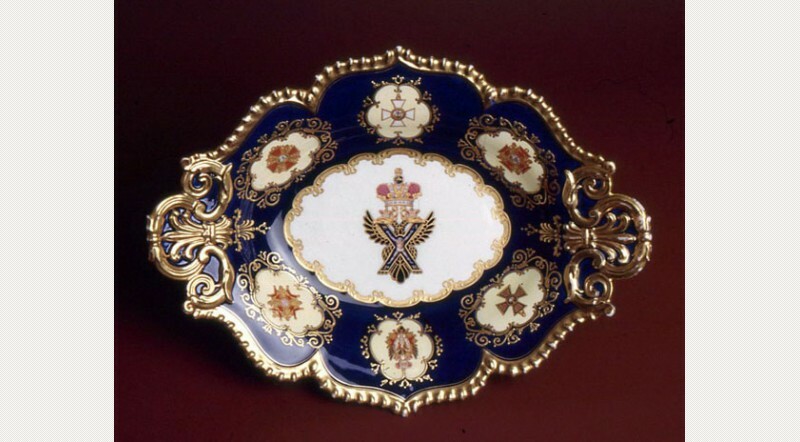 On special occasions, particularly tough venison was roasted and then boiled before being served. Broth from meat stews was drunk with the meals, along with spring water. Deer suet was caught or strained off during cooking to be used as a spread for bread or for drying in cakes, which were then used in trade. Oysters were either boiled or roasted, using the heat to pop open the shells; sometimes the Indians dried the oysters for trade. 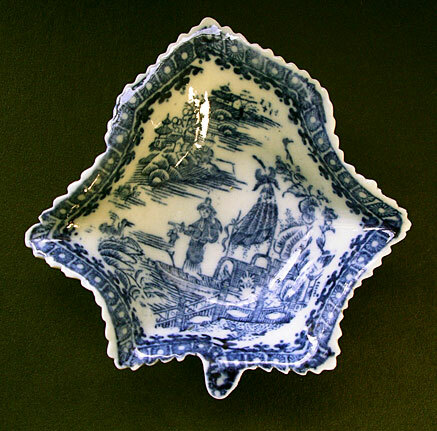 Elite households, prompted by the obligation to feed guests even during the lean times, preserved meats by smoking, a process the English colonists called ” barbecuting ” Indian cooks dried and later ground sweet nuts, removed their shells and stirred in water to make a nut milk which was considered a delicacy. There is a story whereby the Powhatens – captured Elizabeth Hanson with her children. The march back to her captors’ village was so long and grueling that her milk dried up. When she arrived, the Indian women saw her emaciated baby, near death, and restored it to health by providing nut-milk cooked with some cornmeal in it. Virginia Indians may have used it similarly. Source:- MLA Citation Rountree ,H.C. “Cooking in Early Virginia Indian Society”. Encyclopedia Virginia Foundation for the Humanities. 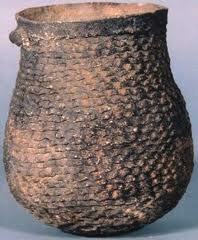 But firstly here is a prehistoric pueblo jar. 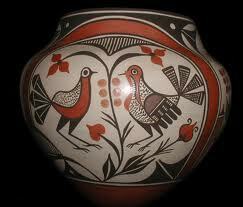 Beautiful Pueblo Pot with Birds. 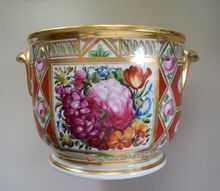 a wedding vase. Picture below. 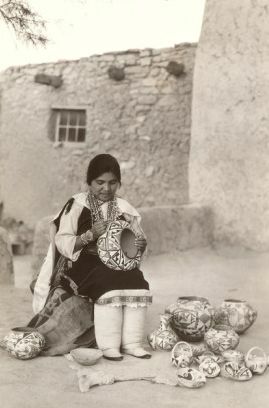 Ancient Hopi woman making pottery. #ThisDayInHistory: July 8th, 1851- Birth date of archaeolist Sir Arthur John Evans.